Following the leading waves of amphibian tractors and medium tanks in to Yellow Beach of Butaritari came the assault companies of the 2d Battalion Landing Team, Company E on the left and Company F on the right. To Company E, commanded by Capt. 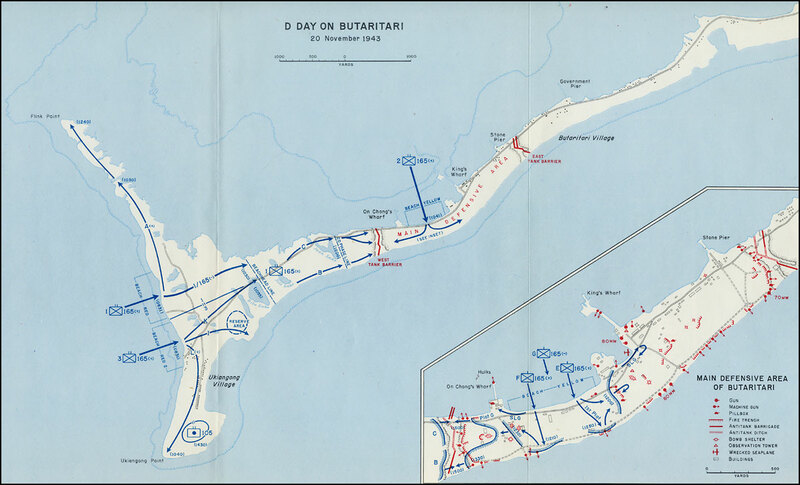 Bernard E. Ryan, was assigned the task of establishing a line across the island west of the East Tank Barrier and holding there against possible attack from the east until the West Tank Barrier had been eliminated. This was intended to be primarily a defensive mission and the details of the company's actions on D Day will be treated later.1 Company F, under command of Capt. Francis P. Leonard, with elements of Company G later attached, had the main offensive mission of moving against the West Tank Barrier in co-ordination with the 1st Battalion Landing Team, which was supposed to be approaching the same objective simultaneously from the opposite direction. 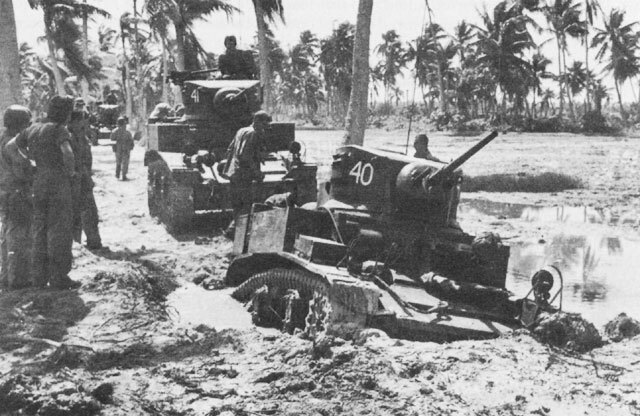 The main enemy installations of the West Tank Barrier were first encountered by Company F rather than by the right half of the special landing group of the 105th Infantry, which had been landed in amphibian tractors. That group had become involved almost immediately in cleaning up the lower end of On Chong's Wharf and in demolishing various shelters between the wharf and the highway in the area through which they were to deploy for the move westward. As soon as the two assault platoons of Company F waded ashore and finished their reorganization at the beach, they plunged inland. Only scattered rifle fire greeted them during this movement. The only established enemy positions found by the assault troops during the first two hours in this area were two machine gun emplacements and seven wholly or partly demolished buildings located at the base of On Chong's Wharf and abandoned by the enemy. Company F's initial move from the beach was, as planned, almost due south. The 1st and 2d Platoons, with the two light machine guns of Company H, the heavy weapons company, carried along between them, started out for the ocean shore. It took them until shortly after noon to reach the opposite side of the island. They struggled through the debris and over the marshy ground beyond the east-west highway without coming to grips with the unseen and scattered Japanese riflemen. 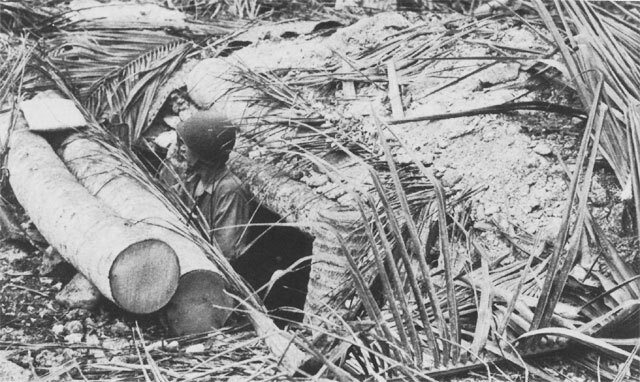 Some of the defenders withdrew deeper into the woods, but some remained behind in concealment to keep up a nerve-wracking fire on the American infantrymen as they advanced across the island. Company F lost one man killed and one wounded from this harassment and managed to eliminate four Japanese and four Korean laborers.4 Although a number of shelters were encountered, no fire was received from them. The only serious handicap to the troops as they moved southward was the terrain and vegetation and a breakdown of communications between the 1st and 2d Platoons of Company F. Their radios had become waterlogged and messenger service between the platoons was inadequate. The result was a gap between the two assault platoons. To fill this growing hole in the line, Company F's 3d Platoon was brought forward from reserve and committed. This meant moving Company G (less 2d Platoon) closer to the advance where it could be used if further strength was needed. However, Company G's 3d Platoon had already been ordered to take a light machine gun squad and relieve the special landing group at the base of On Chong's Wharf. This relief started at 1145, and the diversion of 3d Platoon, Company G, from the main line of advance necessitated calling on some elements of Company H as reinforcement for Company G in its role as reserve.5 These reserve troops now moved into the center of the island and combed the area behind the advancing line. On arrival at the ocean Company F immediately began to reorganize its lines, a movement completed by about 1230. The platoon of Company G that had relieved the special landing group near On Chong's Wharf had been forced to withdraw during the time the destroyer Dewey shelled the hulks, but it now recovered the ground it had given up and took position straddling the island highway on the right flank of Company F.
Defensive Positions on Makin. West Tank Barrier (above); a typical dugout (below). M3 Light Tank, bogged down in a shell crater, holds up the advance on the narrow causeway north of Jill lake. Company B on the right made the most rapid progress. Fire from the east side of the West Tank Barrier, then under attack by the 2d Battalion, held them up for a while, but an advance patrol under 1st Lt. Patrick J. Raleigh was sent forward and about 1500 succeeded at last in establishing contact with Company F.26 On the left, Company C ran into more difficulty when it encountered the only determined resistance between Red Beach and the West Tank Barrier. About 150 yards west of the barrier and to the south of the east-west road, the enemy had emplaced a Lewis machine gun concealed by a natural dip in the terrain and protected by riflemen concealed in and among surrounding trees. 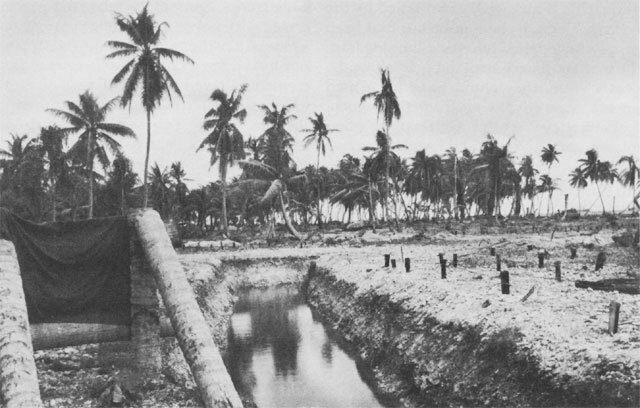 The gun's fire cut obliquely across the main highway, between two sharp bends, and stopped the 1st Platoon, Company C, in a small clearing south of the highway.27 North of this emplacement, on the lagoon side of the highway, was a large palm tree that had around its base a square of heavy coconut logs and raised earth. The platoon leader, 2d Lt. Daniel T. Nunnery, took cover at the base of this tree and proceeded to study the surrounding area. He was shortly joined by Captain Coates, Company C's commander. In a moment, Colonel Kelley, the 1st Battalion commander, moved to reconnoiter the position indicated by Lieutenant Nunnery. In an effort to keep Company C moving to the tank trap and join with the 2d Battalion, he sought out Captain Coates. On the way, he met Col. Gardiner J. Conroy who was ordering a tank up to fire into the enemy position. Colonel Kelley advised that his troops would be endangered by such fire and informed the regimental commander that he would have Captain Coates continue the advance, bypassing the pocket, and leave his support platoon to reduce it. Colonel Kelley moved out to the trees to instruct Captain Coates, who promptly shouted "get down." Just in time Colonel Kelley threw himself to the ground, avoiding an enemy machine gun burst. When Captain Coates signaled to his left platoon, that unit moved over to the lagoon, and under the cover of a three to four foot bank proceeded east and around the clearing toward the tank barrier. shot, although his life was saved by a small medal and identification disk that deflected one of the bullets. Another soldier dashed out to aid the chaplain and dropped dead at his feet. The whole area was now alive with the cracking of rifles and the rattle of the machine gun. Command of the regiment now passed to Colonel Kelley, while that of the 1st Battalion was assumed by its executive officer, Maj. James H. Mahoney.29 The light tanks that had been brought forward by Colonel Conroy retired on Colonel Kelley's order without firing a shot because of the danger of their hitting friendly troops. For the same reason mortar and machine gun fire had to be withheld. a second force of the 2d Battalion moved to the left to take up a holding position. This left-wing force consisted of Company E, half of Detachment Z of the 105th Infantry aboard LVT's, and before the end of the day a platoon of light tanks. Company H, the heavy weapons company, was in reserve on the beach. As Captain Ryan's 1st Platoon moved south across the island it met only desultory resistance--chiefly random fire from lone riflemen in trees and bushes. On its left flank, near the main island highway, the platoon encountered two fortified positions, one a machine gun and the other an antitank emplacement containing a 37-mm. gun commanding the highway. The first had been abandoned and the second, with its cover still on, had been disabled by preliminary bombardment. The 2d Platoon of Company E met even lighter opposition in an area having fewer enemy installations. It moved up quickly to take its position on the right flank of the eastern line across the island. The platoon met sniper resistance but continued to move forward slowly to the line, only being held up for a short while until the 3d Platoon on its left was able to move forward. Three men were wounded during this movement. In front of this position the 3d Platoon was stopped for about four hours. As the troops came up to the position, the Japanese held their fire and the nature of the emplacement was not at first discerned. Three men climbed the west wall and took positions in the kneeling trench, apparently not realizing that there were Japanese beneath them and not noticing the burrow holes. Meanwhile, the machine gun on the right flank of the tunnel had pinned down the body of the platoon, thus leaving the men on top unsupported. Suddenly from the apertures on the east, or far side of the tunnel, a group of Japanese emerged and charged the men on top with bayonets. One of the Americans was killed and another wounded before the platoon's fire cut the Japanese down. More came out. The wounded man was bayoneted to death and the third man was bayoneted but later escaped. Other skirmishers who had not approached the tunnel embankment withdrew immediately. One thing was clear. A far smaller number of enemy had been engaged by the attacking infantry and tanks than had been anticipated. From Yellow Beach south to the ocean and west to Red Beaches, only a few fortifications and entrenchments had been located and many of these were abandoned. The supposition upon which the landing plan had been based--that the western end of the island would be the main area of resistance--had proved false. By the end of the day it was clear that the bulk of enemy troops (estimated next morning to be about 200)45 had abandoned whatever defenses they had built up in the area and had withdrawn to the eastern end of the island to await the advance of the attacking troops. 1. See below, pp. 97-122. 2. Interv, Capt Leonard, Marshall Intervs, p. 48. Note: Because of poor visibility the mortars were not used at any time to support Company F's attack against the West Tank Barrier. 3. Interv, Capt Chasmar, Marshall Intervs, p. 62. 4. Marshall, Makin Notes, p. F26. 5. Intervs, Capt Leonard and Capt Chasmar. Marshall Intervs, pp. 48-50, 62-63. 6. Quoted in Marshall, Makin Notes, p. F30. 7. Lt Col William R. Durand to G-3 USAFICPA, 8 Dec 43, Rpt on Makin Island Expedition, p. 4; Interv, Capt Chasmar, Marshall Intervs, pp. 62-63. 8. Baxter, Armored Force Action on Makin, pp. 1314; Marshall, Makin Notes, pp. EE2-EE6; Interv, Capt Leonard, Marshall Intervs, pp. 48-50. 9. Interv, Capt Leonard, Marshall Intervs, pp. 50; Baxter, Armored Force Action on Makin, p. 14. 11. Marshall, Makin Notes, p. EE14a. 12. Interv, Capt Leonard, Marshall Intervs, pp. 48-50. 13. JICPOA Bull 4-44, map facing p. 1. 14. Marshall, Makin Notes, p. F30. 16. Baxter, Armored Force Action on Makin, p. 13. 17. Interv, Capt Henry Berger, Marshall Intervs, pp. 25-26; 1st Bn 165th Inf Regt Combined Jnl, 20 Nov 43, Msg 56; 165th Inf Regt. Combined Jnl, 20 Nov 43. Msg 65. 18. Intervs. Col McDonough and Capt Leonard. Marshall Intervs, pp. 48-50, 59-60; Msgs cited n. 17; 27th Inf Div G-3 Msg File, 20 Nov 43, Msg 100. 19. Intervs, Capt Berger, Capt Coates, Capt O'Brien, and Capt Paul E. Ryan, CO Co D, Marshall Intervs. pp. 25-26, 24, 22-23, 19. 20. 1st Bn 165th Inf Regt Combined, Jnl, 20 Nov 43, Msg 24. 21. JICPOA Bull 4-44, I, p. 28: Interv, Capt Berger, Marshall Intervs, pp. 25-26. 22. Interv, Capt Berger, Marshall Intervs, pp. 25-26; Marshall. Makin Notes, p. G4. 23. V Phib Corps GALVANIC Rpt, Incl F, Rpt by Special Staff Officers, Sec. 3, Rpt of Engineer Officer, p. 3: 193d Tk Bn Rpt of Makin Opn, p. 68. 24. 1st Bn 165th Inf Regt Combined Jnl, 20 Nov 43, Msgs 28, 31, 34, 39, 40, 41. 25. Ibid., Msg 43; 27th Inf Div G-3 Msg File, 20 Nov 43, Msgs 56, 62. 26. Interv, Capt Berger, Marshall Intervs, pp. 25-26. 27. Interv, Capt Coates, Marshall Intervs, p. 28. 29. 27th Inf Div G-3 Msg File, 20 Nov 43, Msgs 89-91. 30. Ltr, Col Kelley to Gen Malony, 31 Jan 49. 31. 27th Inf Div G-3 Msg File, 20 Nov 43, Msgs 98, 100. 32. Ibid., Msgs 87, 88. 33. Interv, Capt Bernard E. Ryan, Marshall Intervs, pp. 38-41; Marshall, Makin Notes, pp. F22-F24. 34. Interv, Capt Ryan, Marshall Intervs, pp. 38-41; 193d Tk Bn Rpt of Makin Opn, p. 53; JICPOA Bull 4-44. map facing p. 3. 35. Interv, Capt Ryan, Marshall Intervs, pp. 38-41. 36. Ibid., pp. 44-45; Marshall, Makin Notes, p. F31. 37. Marshall, Makin Notes, pp. F31-F32, EEl0: Interv, Capt Ryan, Marshall Intervs, pp. 38-41; 105th FA Bn Makin Rpt, 8 Dec 43, p. 6. 38. Marshall, Makin Notes, p. F32; Interv, Capt Ryan, Marshall Intervs, pp. 38-41. 39. 27th Inf Div G-3 Msg File, 20 Nov 43, Msg 88. 40. V Phib Corps GALVANIC Rpt, Incl B, G-3 Rpt, p. 5, and overlay attached. 41. B Battery carried in addition to its organic 105's four 75-mm. pack howitzers. 42. 105th FA Bn Makin Rpt, 8 Dec 43. 43. USAFICPA Participation Rpt GALVANIC, Annex 10, Table IV. 44. 27th Inf Div G-2 Msg File, 21 Nov 43, Msgs 73, 75, 133, 145.